Christi worked with wealth management advisors for more than twenty years before joining the Foster Financial Group in 2011. She provides exceptional client service and brings her years of experience to bear in all aspects of operations and new business processing. 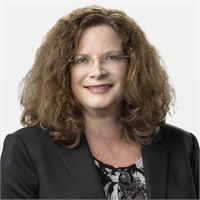 Her securities registrations are held with Ameritas Investment Corp.
Christi’s visits to her mom’s office at Merrill Lynch ignited her interest in financial services at an early age. In those days, a ticker-tape banner stretched across the wall, and associates communicated with squawk boxes. Fortunately, technology has come a long way. As a member of Women in Network, a Network of Community Ministries auxiliary, she lends her energy and expertise to raising money for children in need, providing school supplies and toys in addition to food, clothing, and other necessities. Christi and her husband, John, have been married for twenty-five years. They live in Richardson, where they enjoy spending time with their families, going to concerts and festivals, and including their beloved dog in all their outdoor activities.